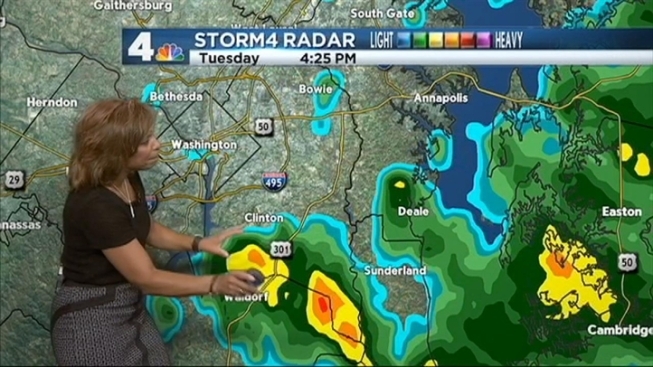 Most of the rainy weather had moved out of the area Tuesday evening. A few storms and showers to the west are expected to die down as they approach the D.C. area, Storm4 meteorologist Doug Kammerer said, but we could see a few more showers. A coastal flood warning is in effect for Anne Arundel County, Md., until 6 a.m. Wedneday due to a tidal anomaly about 2 feet above normal. High tide in Annapolis is at 1:45 a.m.
A coastal flood advisory is in effect for much of the area until 6 a.m. Wednesday due to a tidal anomaly 1-2 feet above normal. Light, scattered showers arrived overnight Monday and have continued through the day Tuesday. D.C. has accumluated less than two-tenths of an inch of rain, but some areas to the north and west got a half-inch to an inch of rainfall. D.C. is still 5.31 inches below average for the year, Kammerer said.